WWE 2K19 arrives as the latest entry to the flagship WWE video game franchise and features cover Superstar AJ Styles. The game is developed in collaboration between Yuke's and Visual Concepts, and published by 2K Sports for PlayStation 4, Xbox One, and Windows PC. It is the twentieth game in the WWE game series (sixth under the WWE 2K banner), and successor to WWE 2K18. 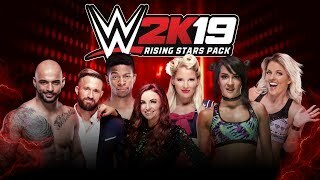 WWE 2K19 showcases a massive roster of popular WWE Superstars, Legends and Hall of Famers, as well as NXT favorites. Experience authentic WWE gameplay, extensive creation options, engaging match types, fan-favorite modes and much more!